1 231.9 millimetres ( 48.5 inches). The Austin Cambridge generated plenty of excitement when it was introduced in September of 1954 but the automotive offerings from Longbridge, England were already highly popular with folks across Canada. Among the first wave of post-war British cars to make the voyage across the Atlantic Ocean to the great Dominion, Austin dealers put out their shingles out in 1946. 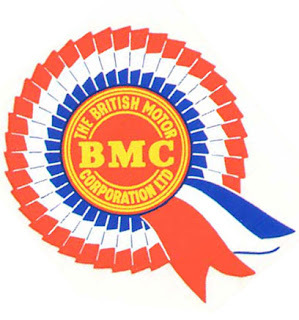 No longer an independent automaker, Austin had thrown in its lot with Morris to create the British Motor Corporation (BMC) on March 31, 1952. 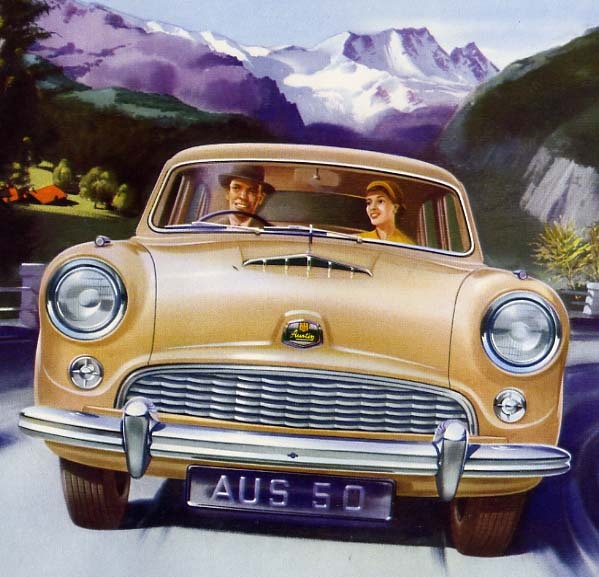 The new Austin Cambridge was the first product to be created under the umbrella of the new combine. Austin sold an entire family of cars here in 1954, including the Seven, the A40 Somerset, the A70 Hereford, the A125 Sherrline Six and the Austin Healey. Canadians registered 2,536 new Austins during the calendar year. That tidy figure made Austin second only to British Ford in terms of sales and still well ahead of West Germany’s Volkswagen. Canadians could buy the two-door Austin Cambridge A50 in 1955, a model not offered in the UK. Engineers went to great lengths to make the Cambridge the most modern vehicle on the road. The vehicle made use of pressed-steel, unitized body construction. Austin wordsmiths wrote that the coachwork had a “fully-stressed skin with no soldered joints.” The styling was certainly in vogue with its modern three-box, slab sides with recessed headlights and wide-mouthed grille. Even the hood scoop was fully functional. The entire Cambridge envelope rode gracefully on 33-centimetre (13-inch) tires and boasted a pert 2 250-millimetre (99.25-inch) wheelbase. 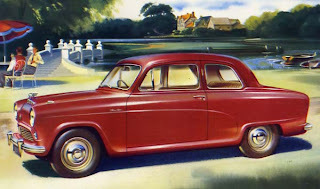 An ultra-modern 1500-cc engine powered the Austin Cambridge. Powered by a thoroughly modern 1500-cc over-head valve, four-cylinder engine, The A50 scooted down highways nicely with its 50 horsepower. 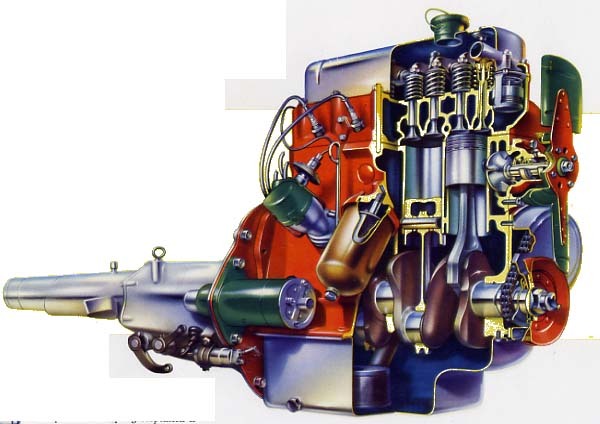 The 1500-cc engine was popular and sturdy; it was shared with the Nash Metropolitan. The Cambridge’s hood hinged open at the windshield and nestled in the engine bay was the latest in automotive technology, a 12-volt battery. On this side of the pond, the Austin Motor Company (Canada) Limited of Toronto and the Austin Motor Company Ltd. (England) of New York City took care of sales and service. For the Canadian and American markets, the four-speed, column-mounted manual transmission was available with optional overdrive for even better than the 80 kilometres per 4.54 litres (50 miles-per- Imperial gallon) advertised. First gear was not synchromesh in the Cambridge. When driven under reasonable conditions, one could expect to get 434 kilometres (270 miles) from the 37.9-litre (8.75-Imperial gallon) fuel tank. Interior of the 1955 Austin Cambridge was cavernous for a car of such small dimensions. Interiors were vast when considering the smallness of the overall vehicle. 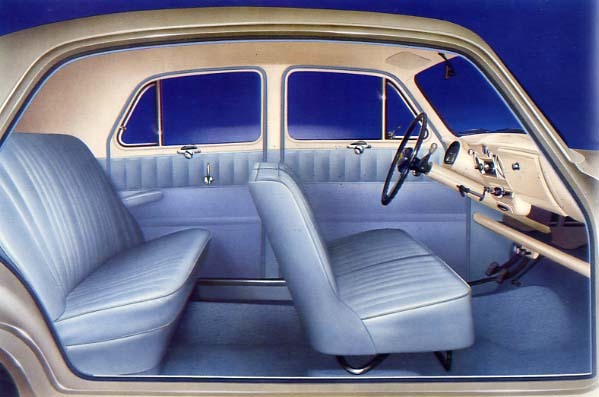 Part of that generous cabin space was created when engineers positioned the back seat ahead of the rear wheels. This allowed three passengers to sit in dignity--if not in complete comfort. The Latex foam cushions promised to hold their shape indefinitely no matter how long the trip might be. The front seats were individually adjustable. Glass area was exceptionally large throughout. Comfort was not forgotten, either. North American export models were wisely equipped with a robust heater and defroster unit included in the base price. 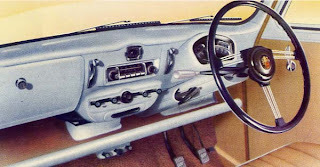 Instrument panel of the Austin Cambridge was most functional (RHD version seen here). The instrument panel was highly distinctive. A large strip speedometer and a full set of gauges were positioned in a telescoping pod that rode part way up the steering column and sat squarely before the driver. A classy touch was a trip odometer. The steering wheel was a three-spoke, 43-centimetre (17-inch) diameter affair with a horn button at the centre of the hub. In typical British fashion, the turn signals operated by a lever located on the centre of the steering hub. Clock, radio and heater were placed in the centre of the panel and the glove box boasted a lockable door. A handy parcel shelf ran below the full length of the instrument panel. Other standard equipment for Cambridge models sold in the Canadian market included bumper guards, a locking gas cap, a safety hood latch located in the car’s cabin, twin horns, twin sun visors, electric turn signals, a chrome windshield reveal, heavy-duty PVC upholstery and a rubber floor mat for the front passengers. Trunk space was 396 cubic litres (14 cubic feet). The spare tire stored away neatly under the car. BMC built 114,864 Cambridge models from 1954 to 1957. 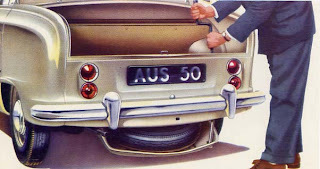 Of that number, 3,357 Austins were registered as new vehicles throughout the Dominion during the 1955 model year.